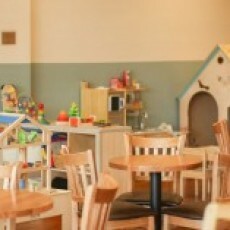 Small Talk Family Cafe is a creative indoor play space geared towards children ages 0-6 plus cafe where parents and caregivers can linger over coffee, tea or a bite to eat while their kids explore and interact in a safe and welcoming environment. Small Talk is about meeting the needs of parents and caregivers. Sure, the kids love the developmental dramatic play area with trains and vehicle toys, dress up, dolls and dollhouses, building blocks and plethora of other toys, activities and fun equipment designed for enrichment. However, this space is made for moms and dads! Think modern coffee house plus a clean, child-proofed environment, open format for easy supervising, a dedicated baby area, healthy, nutritious food and beverage, free WiFi and more. In addition, Small Talk Family Cafe will emphasize environmentally friendly practices with a focus on green toys and equipment, natural, organic offerings, and non-toxic cleaning methods.